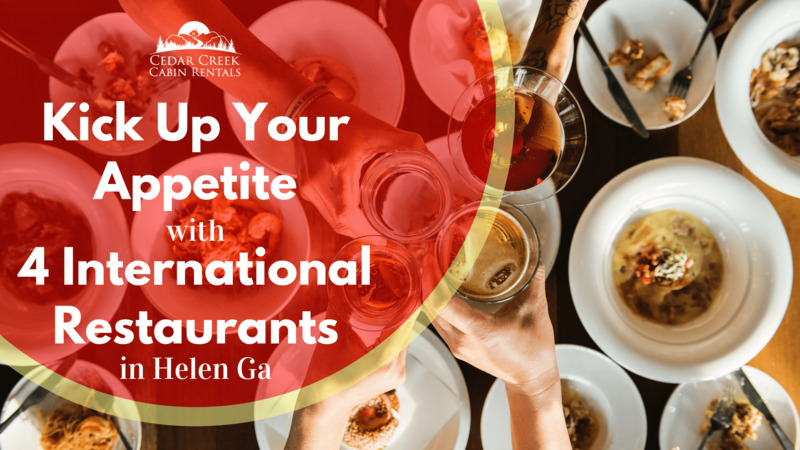 4 International Restaurants In Helen Ga To Kick Up Your Appetite. Helen, Georgia, may be styled after the lovely 19th Century architecture of the Bavarian Alps, but there's a true world of cuisine to explore in Helen and the surrounding areas. North Georgia is one of the US's favorite places to "get away from it all," but at the same time, you can find a range of dining that rivals even the best cities. Now, of course, lovely Helen is best-known for having the best German food in the area. However, beyond our Bavarian fare, there's a whole lot of dining to enjoy in Helen! 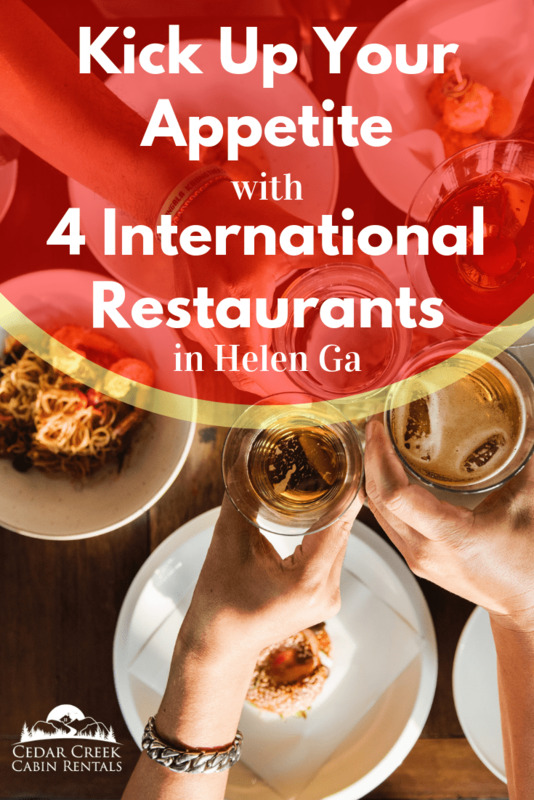 Four Great International Restaurants In Helen You've Got To Try! If you want Mexican, Helen has it! La Cabana maintains two locations on either end of Helen's glorious Main St. La Cabana Express is located just outside of the Helendorf, and is focused on quick bites on the go. At the other end of town, the full La Cabana restaurant features intimate dining and fine riverside views. Whichever you visit, the Valadez family will make you feel right at home! La Cabana is famous for its service. The wait staff is friendly, welcoming, and will ensure your every order is placed properly. 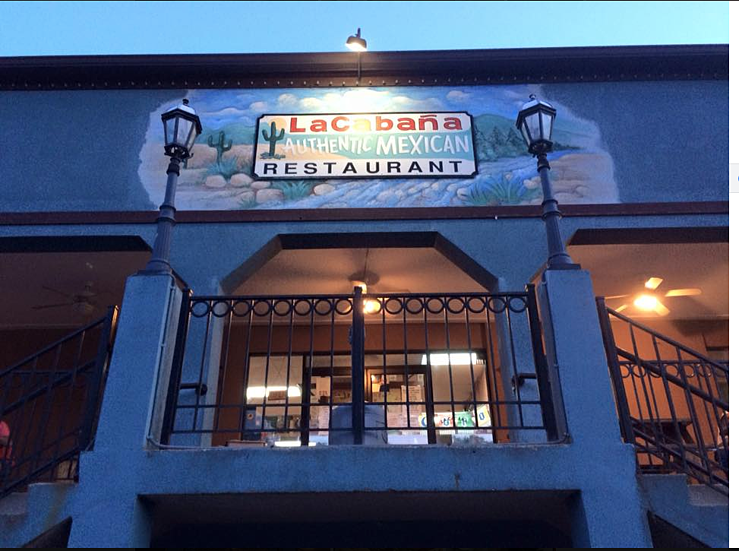 Whether you want to start with their delicious chips & queso or dig right into their hearty burritos, La Cabana has truly wonderful Mexican and Tex-Mex to tempt anyone. Plus, most evenings the full La Cabana has live music: Local bands who play great jams and aren't afraid to get customers in on the fun! If you want a little of everything, the Cafe International is the place to be! This staple of Helen has been in operation for nearly thirty years, and remains a favorite of locals as well as thousands of visitors! It's easy to see why, just from the outside. In a town full of striking Bavarian architecture, the International still stands out from its position on the Chattahoochee River. With the (safely-anchored and cantilevered) patio balcony extending far out over the river, you can look straight down into the flowing waters below. The food comes in big, hearty portions so be ready to take home a doggy bag! Whether you want American, German, Italian, or a mixture, you can get it. However, their real draw is their Best Reuben Ever. We were all saddened when Me So's Korean shutdown, but now Helen has a replacement for lovers of Asian food: Spice 55. 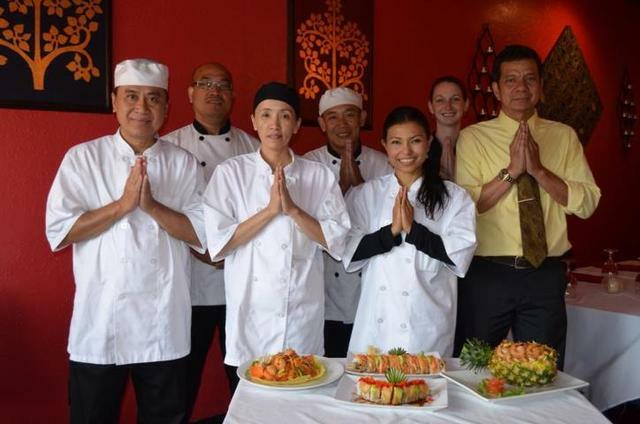 This world cuisine establishment serves primarily Thai food, along with a smattering of Chinese and Japanese - including Helen's only sushi bar! The atmosphere is refined and elegant, emphasizing the quiet dignity of Asian design styles. With their range of exotic noodle dishes and curries, it could be hard to know where to start! However, our pick is the mild and tasty Masaman Curry: chicken in a thick broth of pearl onions, potatoes, cashews, and avocado. If you've never had a far-East curry, it's the perfect place to start. For dessert, try the green tea ice cream! Trust us, it's divine. The Vines is one of our true local treasures. Not only do they serve mouth-watering fusions of French and Italian dishes (can you think of a better combination?) but since they're in the heart of North Georgia's famous wine country, you also get to sample some of the best vintages of the area. In fact, many of you may pass right by The Vines, since it's over in Sautee on the Duncan Bridge Road route towards Helen. So, it makes a great way to start OR finish your Helen adventures. We could spend all day describing their menu and still wouldn't cover it. French and Italian are the pillars, but Chef Jason Vullo fearlessly mixes elements from across Europe. The fare is truly unique, and when paired with a wonderful local wine, creates a dining experience that can only happen in North Georgia. While You're In Helen, Come Home To A Luxury Cabin! Just because you're enjoying the amazing wilderness and outdoor vistas of Helen, it doesn't mean you have to rough it. When you stay in a Cedar Creek mountain cabin, you'll have a home-away-from-home with all the amenities you want and nestled in the foothills of the Southern Appalachians. 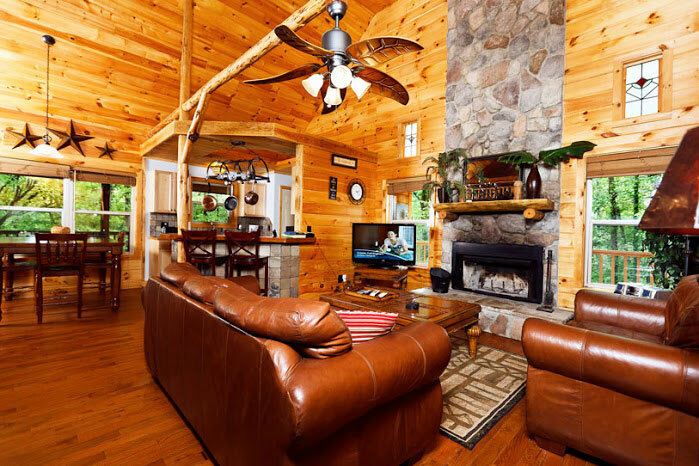 When you've got your own cabin, complete with leather furnishings, full kitchen, and outdoor amenities like a hot tub and fire pit, you might not want to return to your old home! If a Helen adventure is on your mind contact Cedar Creek Cabin Rentals to reserve a cabin!